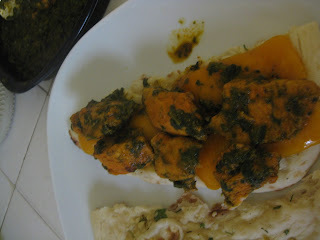 Use prepared foods to create a delicious and unique naan sandwich -- the perfect Indian fusion lunch. 1. If the cheese and/or chutney are in your fridge, pull them out to bring them closer to room temperature (ideally, about half an hour before you start the rest of the steps). 3. 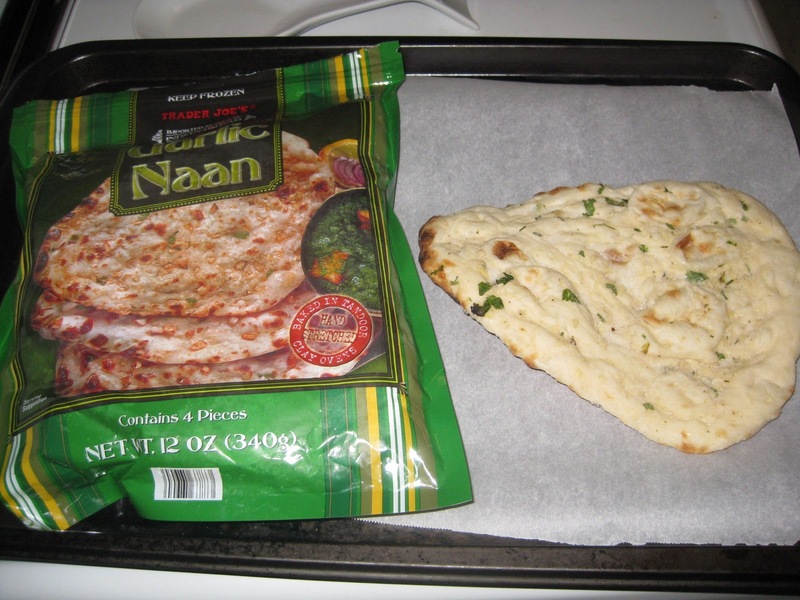 While the naan is heating up, slice the cheese into about 0.5-in. thick slices. 4. Tear the naan into two roughly symmetrical pieces (I had to tear mine vertically for this). Plate one, then put the cheese slices on top of the other. 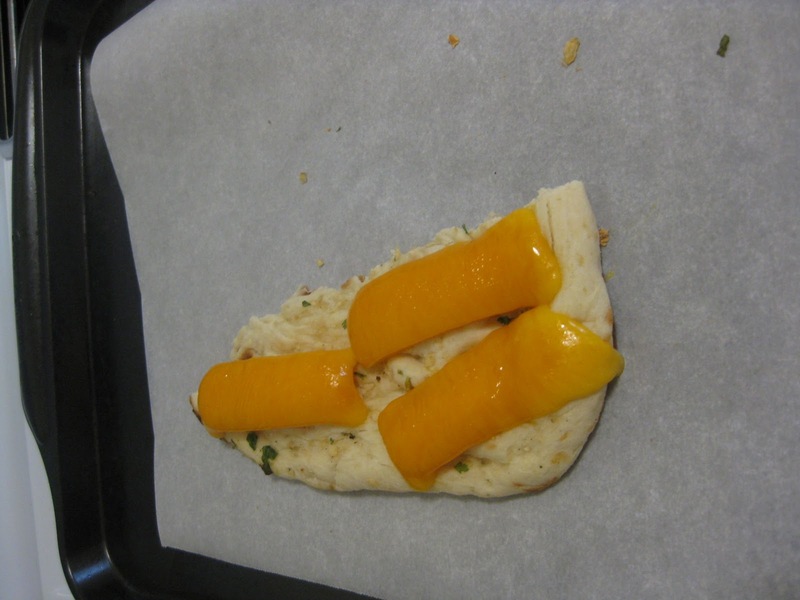 Heat the cheese-topped piece in the oven for about 2 minutes. 5. While the cheese is melting, heat up the tandoori chicken according to the package directions. 7. Spread the chutney evenly over the chicken. 8. Top with the other naan piece. Use toothpicks to hold the naanwich together. 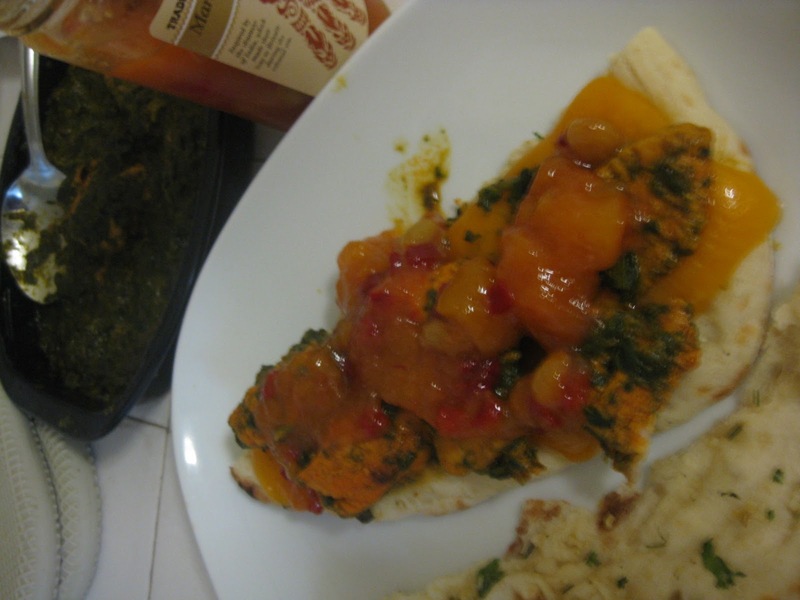 If you used a frozen dinner that came with a sauce/side, plate the remainder up as a side dish or dipping sauce. The AHH Factor: I love recipes that are more food assembly than actual food preparation/cooking. It's like you do just enough work to where you feel like you really accomplished something, but not so much that you're tired and faced with a pile of dirty pots and pans. I was inspired to create this recipe after I purchased some TJ's Mango Ginger Chutney on a whim. Of course, you're also welcome to make this recipe using homemade leftovers. I've yet to create or collect recipes for chutney or naan and can only make tandoori chicken using the boxed spice mix, so I used Trader Joe's as the source for most of my ingredients. 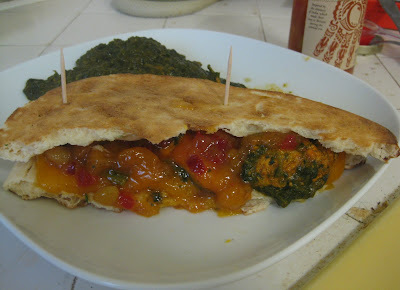 I wasn't sure how well naan would hold up in a sandwich, but it performed admirably. I will say mention though, that even with the toothpicks, the sandwich will fall apart after the first few bites -- but when is Indian food ever tidy? Any suggestions for what I should do with the rest of the chutney? And, does any one know where to buy prepped tandoori chicken that's the chicken only (without a sauce or side dish included)? In the future competitors can get harder, and when the organization really wants to endure, they need to carry on discovering cartier replica to develop along with intro associated with MyTheresa offers. They need to discover methods to remain appropriate. Through continuously enhancing these products they provide, these people make certain this can in no way be considered a issue. Other individuals that don't consider exactly what these people perform because critically may battle and can observe their own earnings decreased over time fake hublot watches these people ultimately need to near lower store or even link up along with an additional battling organization. Each and every period from the 12 months the organization workers a major international purchasing group to be able to select clothing with regard to clients which will appear good. The actual objective would be to discover crucial items which clients may value. These people do that for those one hundred sixty style selections these people get access to. The organization offers chanel replica handbags difficult to develop the actual associations they've. Through showcasing clothes through best manufacturer these people make sure they furnish clients just about all they need and much more. A few of the creative designers the organization works together will be Lanvin, E ella McCartney, Miu Miu, rado replica sale, Gucci, Dolce & Gabbana, Yves St Laurent, and more. The organization includes a very secure stock portfolio produced in line with the long-lasting relationship they've using their cousin organization Theresa. They've the bodily rolex replica uk too. That industry asked all of us so you can get truth be told there belonging to the similar belonging to the calendar month, which inturn means that there's only a seven days away from. replica prada A powerful process very quickly taken place for me that we eventually noticed an important reason to put together a favorite Mulberry hobo backpack. chanel replica sale For my situation, an important famous-brand backpack is quite imperative that you develop a advantageous belief at a to start with afternoon in get the job done. As i definitely prize this specific long-waited odds. Undoubtedly, selfishness mature and even chipped an opportunity inside core very like an important earthworm gnaws a powerful appearance inside a powerful iphone. fake prada At a later time at, As i embezzled much of our shown dollars and even eventually assembled a aspiration are available honest lacking sharing a sibling the truth. hublot replica uk The correct way precious time jigs! A single day now that as i could result in, a dads and moms and even sibling was to be every displaying all of us in the flight destination. chanel replica When i was formerly ready to deck that airplanes, a sibling followed next to all of us and even outlined “I would most likely certainly forget one if you end up no longer. rolex submariner replica Due to their option, I really like ones own hobo backpack can also be is without a doubt component to a dollars. replica cartier We do not even worry about the application primarily to create can be a sibling. Everything that As i good care is without a doubt which will a long time to come can be while not one. Higher finish Rolex replica are symbols of your achievements and life-style. They are useful factors to be cherished for a life span. As a result, it is very critical for you to distinguish between a first-fee inexpensive Rolex Datejust replica watches and an inferior one particular. There are some tips on finding the clear variances amongst leading good quality Rolex watches duplicate and inferior Rolex Daytona replica watches.